Looking for Recycling or Waste Paper Bins? Workplace rubbish disposal can be easily managed with strategically placed bins. Whether it's an office, or a loading yard or packing centre. Having a clean workplace raises the morale of workers. A clean workplace is a very simple way to keep workers spirits up! 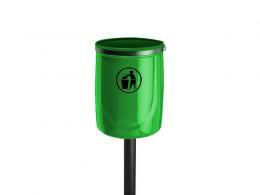 We offer waste bins of varying sizes for use in different outdoor locations as the need arises. These bins are both fixed and mobile to meet the demands of different types of locations. 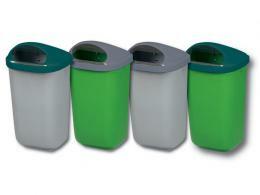 Standard litter bins come in a dazzling array of designs and sizes to cater for all sorts of solid waste. Made of either wood, plastic or galvanised steel to suit any type of interior decor. 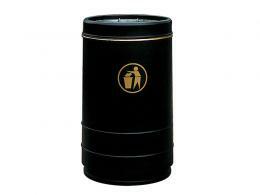 Open top disposal bins are ideal for managing solid waste within an office or a conference room. 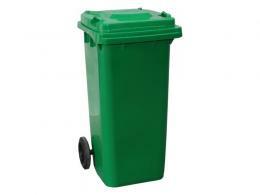 Looking for a free-standing open top bin? 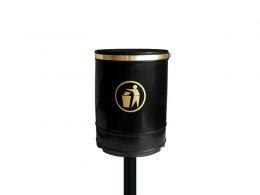 Try the Pickwick black plastic litter bin with large 90 litres capacity. UV stabilised weather resistant durable construction are suitable for indoor and outdoor use. Supplied with ground fixings. Wheeled disposal units offer a mobile solution for waste removal. Post or wall bins can be strategically located to collect trash which is later carried to a dumpster. They are much more efficient than using manual disposal methods. They allow employees to get back to work faster and reduce the chance of injury. Wheeled skips serve as sanitary repositories for waste from these sources. They come in a variety of sizes so you can decide which one best suits your companies needs. Having a problem with dog waste? 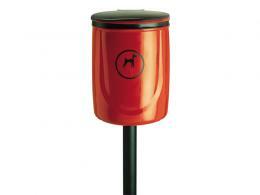 Our Dog Bin is a great way to make sure your workplace remains sanitary when owners bring their dogs along. Having an available rubbish bin can make all the difference in keeping a workplace clean. Preventing areas getting tainted by careless disposal of waste. For a business, a clean surrounding is a great first impression on a customer. 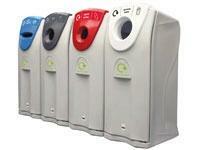 The Workplace Depot makes it easy to order the waste disposal unit that suits your business best. Call us on 0800 0126777 or browse our website to see what we have on offer.